One of the greatest mysteries facing humans is how life originated on Earth. Scientists have determined approximately when life began (roughly 3.8 billion years ago), but there is still intense debate about exactly how life began. One possibility has grown in popularity in the last two decades – that simple metabolic reactions emerged near ancient seafloor hot springs, enabling the leap from a non-living to a living world. Recent research by geochemists Eoghan Reeves, Jeff Seewald, and Jill McDermott at Woods Hole Oceanographic Institution (WHOI) is the first to test a fundamental assumption of this ‘metabolism first’ hypothesis, and finds that it may not have been as easy as previously assumed. Instead, their findings could provide a focus for the search for life on other planets. The work is published in Proceedings of the National Academy of Science. In 1977, scientists discovered biological communities unexpectedly living around seafloor hydrothermal vents, far from sunlight and thriving on a chemical soup rich in hydrogen, carbon dioxide, and sulfur, spewing from the geysers. 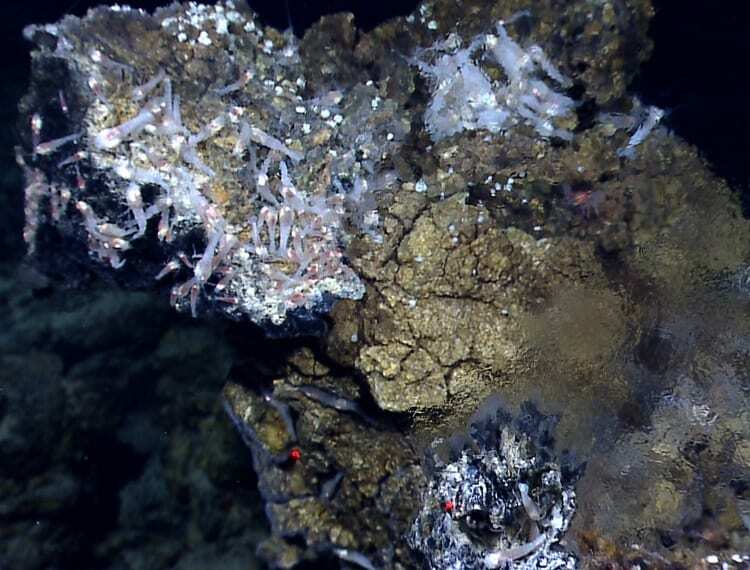 Inspired by these findings, scientists later proposed that hydrothermal vents provided an ideal environment with all the ingredients needed for microbial life to emerge on early Earth. A central figure in this hypothesis is a simple sulfur-containing carbon compound called “methanethiol” – a supposed geologic precursor of the Acetyl-CoA enzyme present in many organisms, including humans. Scientists suspected methanethiol could have been the “starter dough” from which all life emerged. The question Reeves and his colleagues set out to test was whether methanethiol—a critical precursor of life – could form at modern day vent sites by purely chemical means without the involvement of life. Could methanethiol be the bridge between a chemical, non-living world and the first microbial life on the planet? Carbon dioxide, hydrogen and sulfide are the common ingredients present in hydrothermal black smoker fluids. “The thought was that making methanethiol from these basic ingredients at seafloor hydrothermal vents should therefore have been an easy process,” adds Reeves. And when they did get out there, the scientists were surprised by what they found. To directly measure methanethiol, the researchers went to hydrothermal vent sites where the chemistry predicted they would find abundant methanethiol, and others where very little was predicted to form. 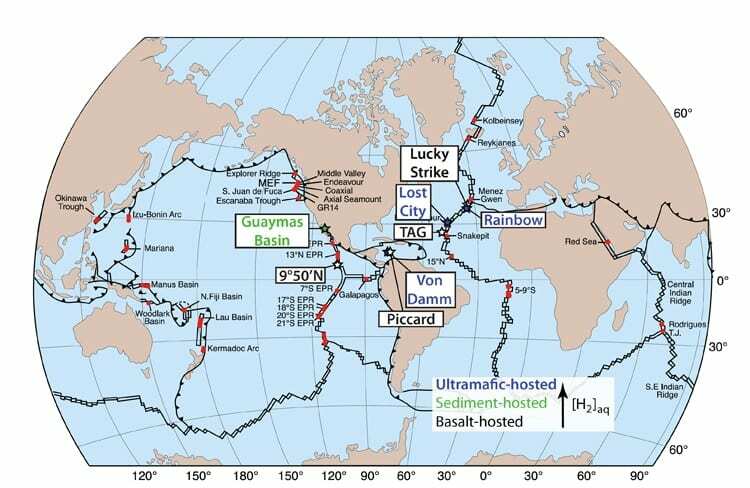 In total, they measured the distribution of methanethiol in 38 hydrothermal fluids from multiple differing geologic environments including systems along the Mid-Atlantic Ridge, Guaymas Basin, the East Pacific Rise, and the Mid-Cayman Rise over a period between 2008 and 2012. “Some systems are very rich in hydrogen, and when you have a lot of hydrogen it should, in theory, be very easy to make a lot of methanethiol,” says Reeves. The fluids were collected in isobaric gas-tight samplers (IGTs) developed by Jeffrey Seewald, which maintain fluids at their natural pressure and allow for dissolved gas analyses. Instead of an abundance of methanethiol, the data they collected in the hydrogen-rich environments showed very little was present. “We actually found that it doesn’t matter how much hydrogen you have in black smoker fluids, you don’t seem to be making a lot of methanethiol where you should be making a lot of it,” Reeves says. Surprisingly, in the low-hydrogen environments, where much less should form, the research actually found more methanethiol than they had predicted, contradicting the original idea of how methanethiol forms. Overall, this means that jump-starting proto-metabolic reactions in hydrogen-rich early Earth hydrothermal systems through carbon-sulfur chemistry would likely have been much harder than many had assumed. 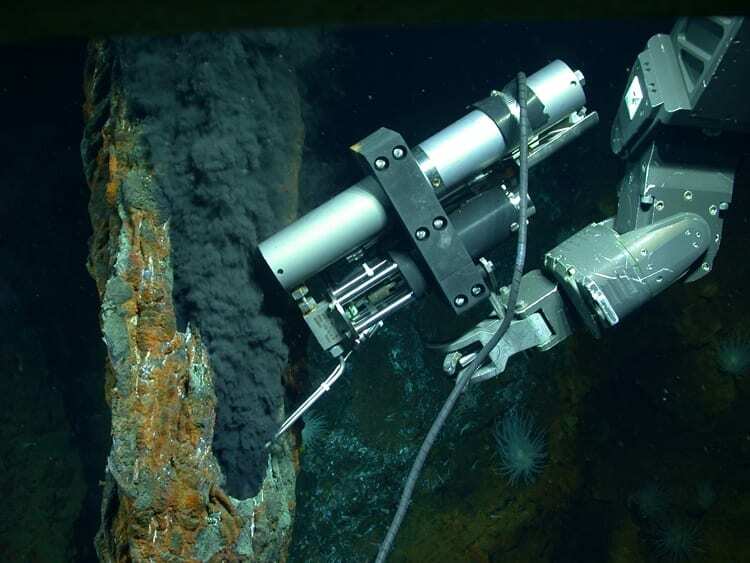 Critically, the researchers found an abundance of methanethiol being formed in low temperature fluids (below about 200°C), where hot black smoker fluid mixes with colder sea water beneath the seafloor. The presence of other telltale markers in these fluids, such as ammonia – a byproduct of biomass breakdown – strongly suggests these fluids are ‘cooking’ existing microbial organic matter. The breakdown of existing subseafloor life when conditions get too hot may therefore be responsible for producing large amounts of methanethiol. This research was supported by grants from the National Science Foundation and NASA. 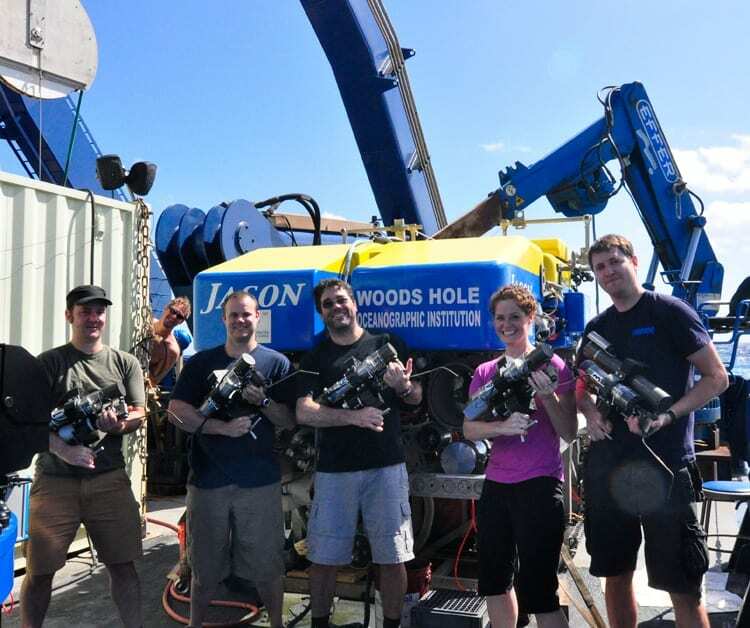 Additional funds were provided by the WHOI Deep Ocean Exploration Institute, InterRidge, and the Deutsche Forschungsgemeinschaft Research Center/Cluster of Excellence MARUM “The Ocean in the Earth System” (E.P.R. ).